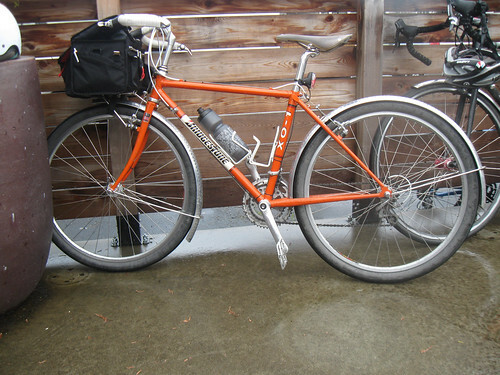 This was the third Populaire I’ve done with the Seattle International Randonneurs and the third one where it rained. This was the rainiest of the bunch though. 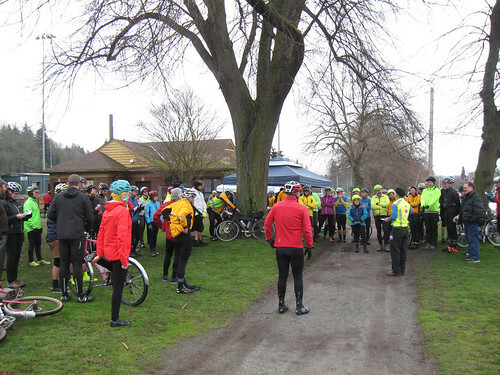 The ride started 9am at Woodland Park in the Wallingford neighborhood of Seattle. It started drizzling a few minutes before the start and was a good steady rain by the time we reached the Burke-Gillman Trail (BGT) heading toward Golden Gardens State Park. By around mile 15 my cue sheet had completely disintegrated. By mile 21 my bicycle computer konked out. I pretty much relied on the fact that the route was mostly a there and back to Redmond on the BGT and trying to stick with a group of riders. The downside of that though was that most of the ride was on rail trails. 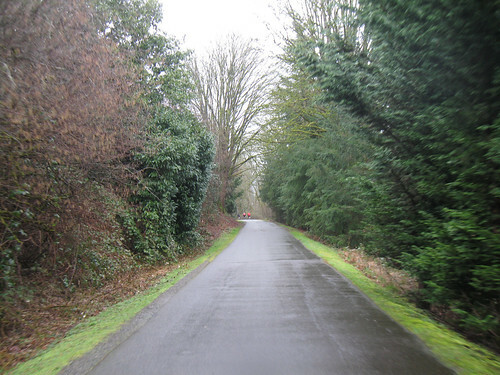 We rode a stretch of the BGT to Golden Gardens, did the climb up to Loyal Heights, cut across to the Interurban which we rode north to the BGT Connecter. The Connecter – which is a newly “signed route” – was one of the routes I’d worked out back when I lived on the eastside. 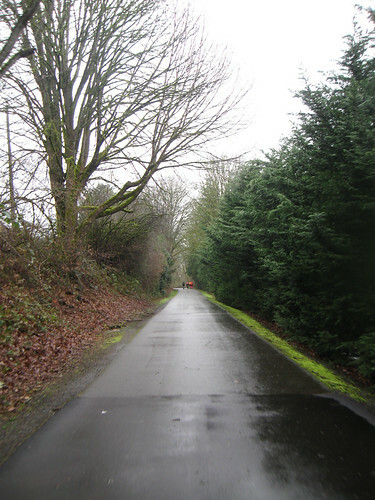 It features a long descent down to Lake Washington in Lake Forest Park. A soaking wet descent on this day. Then it was pretty much the trail to the Redmond Whole Food Plaza which was a control and place for food/coffee/drying out. I changed my socks there and grabbed some produce bags to try to keep them dry for the ride back. I also downloaded the route to my phone, but it being so wet I wasn’t sure I could really rely on the phone. But since it was 11 miles back on the BGT I knew I was set for a while. It was a slog back on the BGT, though there was a good 20 minutes without rain. The fresh pair of socks in their shopping bags did a good job keeping my feet dry. I was alone most of the time, once passed by about 8 randos who’s pace was definitely outstripping mine. The next group that overtook me, I made a point of sticking with and was able to take advantage of their surviving cue sheets and GPS to get to the finish. This last bit climbed up into Ravenna, made it’s way under I-5 and then the final climb to Phinny Ridge. As always the ride ended at Zeek’s Pizza where I had my usual Veggie Thai pizza and a couple of pints. Pumpkin Orange XO-1 at the finish. The rain had stopped when I left but a brutal wind out of the south (the direction home of course) had picked up. So I rode to UW and took the Light Rail to Beacon Hill. So good times all in all. Character was built.